1. 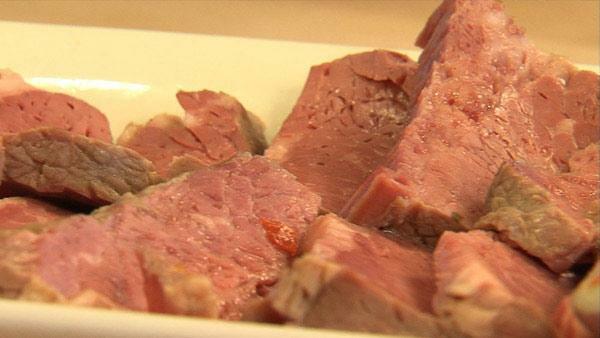 Place corned beef in a large pot or Dutch oven. Pour in beer and water so meat is covered by 1-2 inches. Add coriander seeds, bay leaves, chile pepper and allspice. Bring to a boil then reduce to a simmer and cover the pot. Cook for 2 hours then check the beef by tasting or inserting a knife. If it shows no resistance, it is tender. If not, continue to cook until tender. Remove beef. 2. Add vegetables and cook at a slow boil for 20 minutes or until the cabbage is done and the potatoes and root vegetables are tender. Add back beef to re-warm for 2-3 minutes. Cut meat across the grain into 1/4-inch slices and arrange on a platter with the vegetables. Serve with Horseradish Cream and Guinness Mustard Sauce. Note: I like using a little dark beer to boil my corned beef, which provides a pleasant malty flavor. Use a dark beer such as Guinness or other Stout or for a hint of sweetness, try a Porter. Make sure to have lots of leftovers to make your favorite hash recipe and Grilled Corned Beef and Fontina Cheese Sandwiches. (See recipe in Segment #4) And don't throw the stock away. Use it to make a cabbage or other winter vegetable soup.